Episode 36: Maddy Curley from Stick It and Brooke Buffington On Their New Gymnastics Movie! Maddy Curley and Brooke Buffington (R) have launched a Kickstarter campaign to fund the gymnastics script they co-authored called Chalk It Up. This week, University of North Carolina gymnast, actress and stunt woman, Maddy Curley–who played Mina in Stick It–joins us to talk about the next great gymnastics movie! Maddy and her writing partner, UNC gymnast Brooke Buffington, tell us all about: writing the script for Chalk It Up, what it was like to be in Stick It, intimidating male co-stars, advice for adult gymnasts, realism and pet-peeves in gymnastics movies, what it takes to get a movie made, and how Maddy managed studying theater and performing in plays all while competing in college. Check out the trailer for the movie below. It looks gymtastic! We discuss the latest news from The Ranch, the rumors that Mustafina‘s coach Alexandrov is moving to Brazil, the two new docu-series about Jordyn Weiber, a GIF based gymnastics skill wiki, answer a GymLine question from a perspective coach, and get alllll the latest rhythmic gymnastics drama from Kabaeva‘s alleged affair with freedom-of-informaton-hating Putin to the current FIG investigation of judges. Remember to fill out the Pro Gymnastics Challenge Survey here. 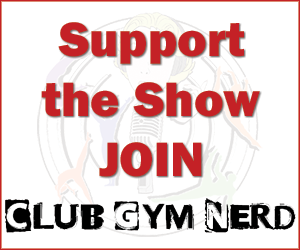 June GymNerd Challenge is on! We call upon your power, oh great Gymnastics Army! Maddy and Brooke are trying to self-fund their movie. Support their effort by donating via Kickstarter here and then hold your own handstand-a-thon or cartwheel-a-thon as a fundraiser for the movie! Hold your own fundraiser. Do a cart-wheel or handstand-a-thon. Get friends, family and co-workers to pledge $1 for every cartwheel you do in 10 minutes. Or ask them to donate $5-10 for every second you hold a handstand. Collect the cash and donate the money to the movie through Kickstarter. Report back to us! Share your photos, videos and stories. Let’s get this great gymnastics movie made! Get updates on the Chalk It Up Facebook page. Maddy Curley‘s famous “Joanne, Haley is on the phone. She’s gonna do a real dismount,” line from Stick It. Part 3 of the Triple Twist Gymblog & Chris Sacculo’s series on Jordyn Weiber. McKayla Maroney back at The Ranch! What do you think it will be worth when she does it? Well, the Amanar is now worth a 6.3, so maybe the TTY would take its place at 6.5? Either that or 6.7. I’ve never really liked the handspring double front vault anyway.